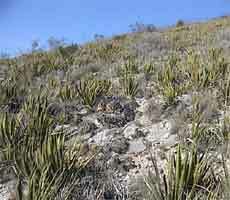 Ariocarpus retusus LRM321, habitat near Ramos Arispe. 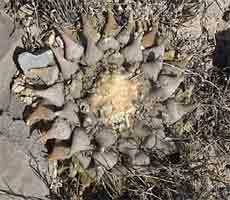 Ariocarpus retusus LRM321, a very old clustered specimen. 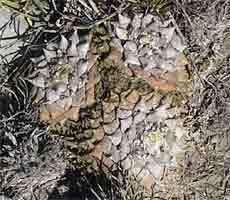 Ariocarpus retusus occurs here at one of the more northerly locations for the species in association with many other cacti, including, Lophophora williamsii, Thelocactus rinconensis, Epithelantha pachyrhiza, and Turbinicarpus valdezianus. As in many other locations the form of the plant is variable.